I am back from my mom’s home.I had a great time with my parents and sis:).I learnt some side dish recipes from my mom.Let me start with this sambar.Yesterday I prepared this sambar for idli.It tasted great! !I was very happy because my FIL and Hubby dear ate well!! 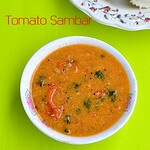 I thank my mom for teaching me this yummy side dish for idli:) This tomato sambar is without dal.Coconut and tomato gives the base for this sambar.If you are bored of making moong dal or toor dal sambar recipes for idli dosa,do give this a shot.You may like it.If you are looking for tomato sambar recipes without coconut and dal,please check this & this link.Lets see how to make this yummy thakkali sambar for idli. Wash and chop the tomatoes.Boil it in a bowl of water till it cooks well.Remove and let it cool.Drain the excess water and keep in a bowl.Do not discard it.Now mash the tomato using a ladle or whisk.You can also grind it in mixie to a paste if you want a clear sambar without tomato pieces.The point is tomato should be pulpy and mashed well.Slice onions.Slit green chillies and chop coriander leaves. Heat oil in a kadai and splutter mustard seeds,urad dal and chana dal.Add sliced onions,slitted green chillies,curry leaves and hing.Saute for a minute.Add salt and the tomato cooked water to this and cook the onions. 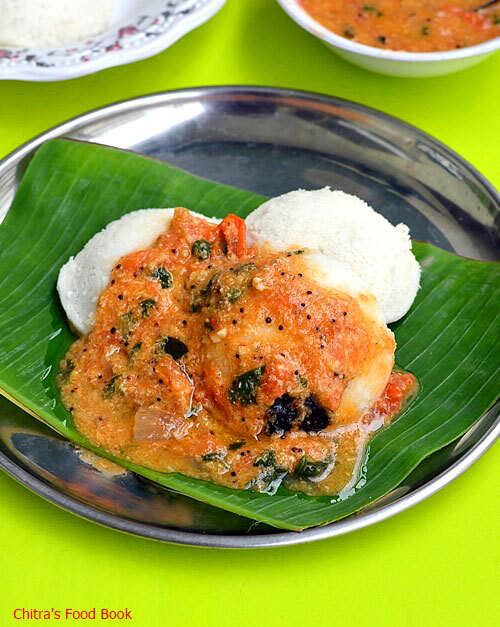 After the onions are cooked well,add the mashed tomato and ground coconut paste.Let it boil well for few minutes.Add some water if needed.Adjust the consistency of sambar as per your wish.Garnish with lots of coriander leaves and serve hot with idli.Drizzle a tsp of sesame oil while serving.Enjoy ! 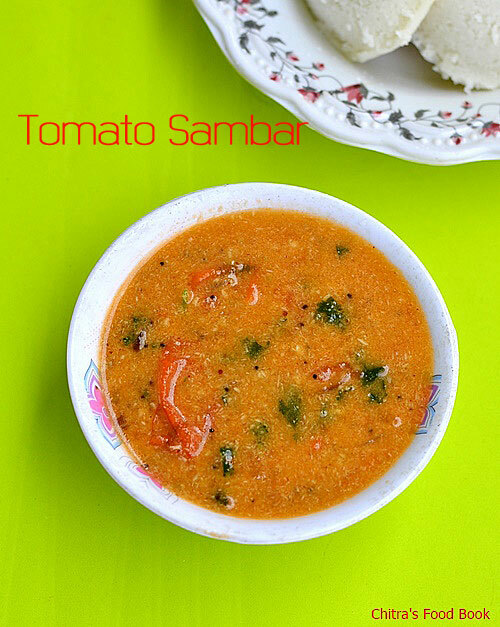 Try this easy tomato sambar for a change.Tastes good with hot idli ! Am the first one to comment....looks wonderful.I loved ur Kitchen Clinic...i guess this one makes ur blog outstanding.Great girl! Thanks a lot.Ur comments are really motivating me:)Thanks for ur immediate response. Wowo the sambar looks so yumm. It is totally different tha ti make. I'm new to your site and you have laid it out well. Sambar looks different from how I make it, definitely gonna try once. And Kitchen clinic is extraordinary. Keep it up! very simple procedure and tasty it seems.. thanks for sharing both the recipe and clinical tips... good one. Love this variation of sambar, looks fantastic...just one question when you say fried gram to grind is that pottu kadalai/dalia or chana dhal ? Interesting sambar, bet it tasted great with idly...looks fab' dear. Thanku frnds for ur lovely comments!! sambar looks great with idly. ur pics shows how its good. Wow calls for less ingredients and sounds yummy. Idlis looks gr8. Your sambar looks delicious, Chitra, as do those fluffy idlis. You have a nice blog here. Looking forward to seeing many more delicous recipes from you. For the egg replacement : As my recipe contains pretty much good amount of egg. Replace with silken tofu ratio for each egg : 1/4 cup of silken tofu. First time to ur blog. Ur idlies are looking great & fluffy. Thanku frnds for ur encouraging comments!! Its the same recipe my mom used to prepare for idli, just one small difference, my.mom use to put in few cloves while frying onion. This gives superb flavour, try this n let me know.